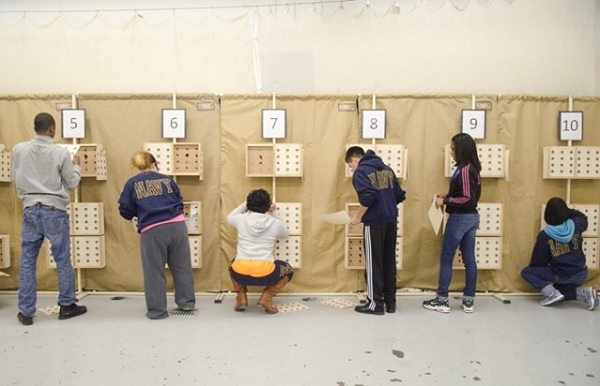 JROTC Firing Ranges in our High Schools Expose Children to Lead - World Beyond War . . .
By Pat Elder, September 29, 2017. Children are being exposed to toxic lead particulates through their participation in the Junior Reserve Officers Training Corps (JROTC) Marksmanship Program in the high schools. Air gun rifles used in high school classrooms and gyms across the country discharge lead fragments at the muzzle end of the firing line and at the target backstop. JROTC officials feel it’s unnecessary to clean their guns regularly. That’s because every pellet being fired down the barrel scrapes out the deposits of lead from the pellets that went before. The manual on standard operating procedures published by the JROTC Cadet Command says it’s recommended to clean rifles every 1,000 to 2,000 shots. 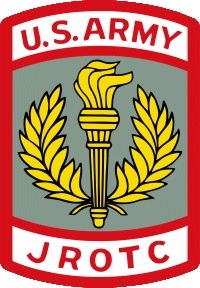 This YouTube video from the Grissom High School Army JROTC Marksmanship Program in Huntsville, Alabama shows a plume of lead-filled smoke emanating from the muzzle end of the rifle. Which way will the ventilation system carry the plume? Noordhoek, Niels. “4.5mm Pellet Exiting an Air Pistol, Photographed with a High- Speed Air-gap Flash.” WIKIMEDIA COMMONS, 8 OCT. 2011. A standard .177 caliber lead pellet is shown being fired from an airgun. 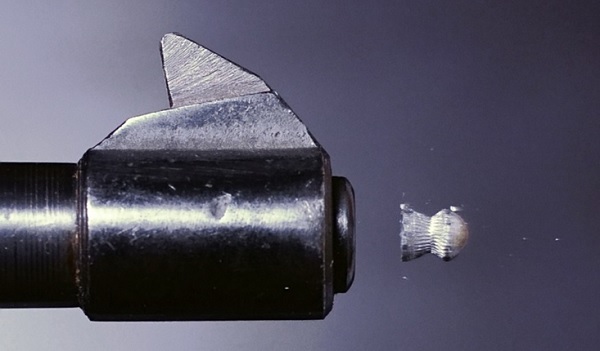 Here, you can see tiny lead fragments being discharged at the muzzle end of the gun. 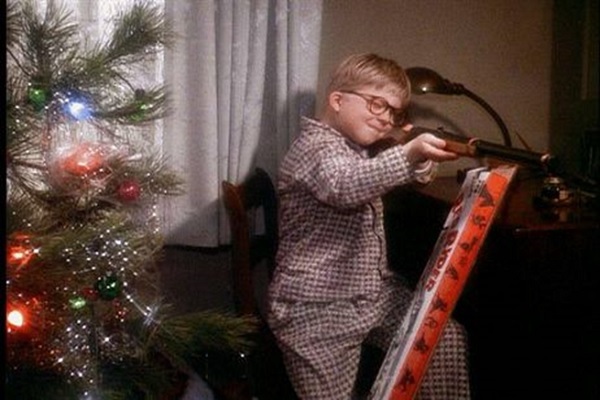 The bb gun Ralphie got for Christmas fired a steel bb at 350 feet per second. The Daisy Avanti 887 CO2 air rifle, a powerful cousin of Ralphie’s Red Ryder, is classified as an Army weapon and is used by Army programs in high schools. It shoots a .177 cal. lead pellet at speeds of 500 feet per second. This video shows tiny lead particles mixed with the pellets. Students regularly handle these pellets while loading their weapons. A German study found that 20 individuals who shot only air guns showed a median blood lead level of 33 micrograms per deciliter. The Journal, “Environmental Health” reports that Airgun Shooters after an indoor shooting season had average Blood Lead Levels of 8.4 micrograms of lead per deciliter, with some as high as 22.2. Demmeler and Nowak, writing in the International Archives of Occupational and Environmental Health also documented high BLLs in indoor airgun shooters. They linked blood lead and gun caliber for a single session. Their scale ran from 3.3 micrograms of lead per deciliter for airguns, with some as high as 12.7 micrograms of lead per deciliter. A Swedish study analyzed the air in an indoor firing range that was used exclusively for air guns and found the air had lead levels an average of 4.6 micrograms per cubic meter. The EPA has established an air quality standard for lead at 1.5 micrograms per cubic meter. That’s three times the level. Regularly firing lead projectiles indoors at 500 feet per second in programs involving thousands of high schools is terrible public policy. 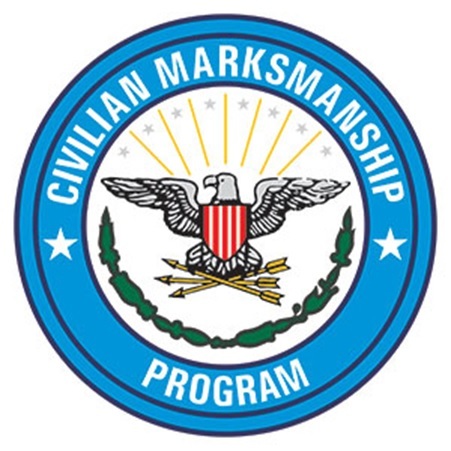 The Civilian Marksmanship Program (CMP) is the congressionally chartered entity charged with regulating the program. It says, “Target shooting with air rifles and small-bore rifles does not create real health risks for shooting sports participants. They say children can effectively minimize their lead exposure by washing their hands after firing, and by not consuming food or beverages on the range. NIOSH says washing hands with soap and water is not effective in removing lead from the surface of the skin. The Civilian Marksmanship Program claims to have trained more than 4,000 JROTC instructors since 2005. The CMP sells the Army’s discarded weaponry, especially rifles and ammo, to the American public. We’re the only nation on earth to allow such lunacy. The privately-owned CMP holds $184.7 million in securities while it spends less than a half million a year monitoring shooting programs in our high schools. The CMP is a sweetheart of the NRA. Often, JROTC children attend events sponsored by the NRA. The NRA actively supports the establishment of new firing ranges in our schools. The CMP’s Guide to Lead Management, the rulebook used by JROTC Marksmanship Programs, relies on the findings of Health & Environmental Technology LLC (HET), an environmental testing firm in Colorado Springs, to dispel the notion that air guns shooting lead pellets create airborne particles. The sole employee of HET is Mr. Robert Rodosevich. Based on the finding by Rodosevich, the CMP says normal ventilation systems are fine for shooting ranges in America’s high schools and in private gun clubs where CMP affiliated clubs practice. Rodosevich came under scrutiny in Colorado in 2012 for “gross technical incompetence in technical compliance.” Colorado health officials said Rodosevich violated state regulations by entirely failing to demonstrate that he has any kind of knowledge in performing environmental work at all. Meanwhile, the work performed by Rodosevich for the CMP is cited by high school officials across the country who are forced to defend the presence of indoor firing ranges in their schools by parents concerned about the potentially harmful effects of lead contamination. This photo from Northwestern High School in Flint, MI shows students remove their targets after a session at the school’s indoor shooting range on Monday, Feb. 3, 2014. The school’s firing range is monitored by the CMP. The principal of Northwestern was unaware of the potential for lead contamination and referred questions to the county health department which referred concerns to the EPA which said JROTC was a military program and complaints should be directed to the military branches. The CMP recommends that school staff establish a lane to provide a designated walking path for the coach or authorized athlete to follow while moving to the target line. At the target line, it is recommended that the designated target changer put on disposable shoe covers before walking over any residues that may be in front of the targets. Once targets are changed, the designated target changer should remove the disposable shoe covers before stepping onto the walking path and returning to the firing line. Apparently, students in Flint aren’t following these recommendations. At Boca Ciega High School in Gulf Port, Florida and Germantown High School in Ridgeland, Mississippi students clean the ranges. At Caddo Parish schools in Louisiana, students clean the ranges, but they’re required to use respiratory equipment to protect from the airborne lead. Obviously, uniform enforcement is lacking. Students at Leadership Academy for Young Men in Rochester, NY use the boiler room of the school to shoot their rifles. This video shows students at the target backstop where lead residue often settles on the floor in front of the target. The kids are coming into contact with lead at the firing line and at the targets. The sergeant assigned to the school remarks during the video, “Not everyone is privileged enough to have a school that is so supportive.” It is condescending at its core and represents the despicable intersection of racism, classism, and militarism. JROTC instructors are usually the only non-degreed personnel allowed to teach credited classes. They also teach U.S. history and government. 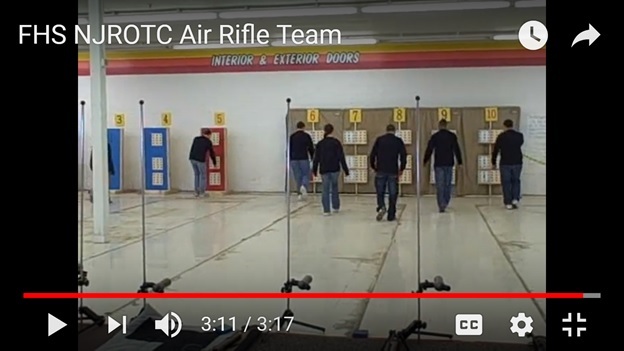 This video shows Freeport HS (IL) JROTC cadets walking through the discharge of lead on the floor at the muzzle end of the gun on their way down to the lead-filled target backstop. 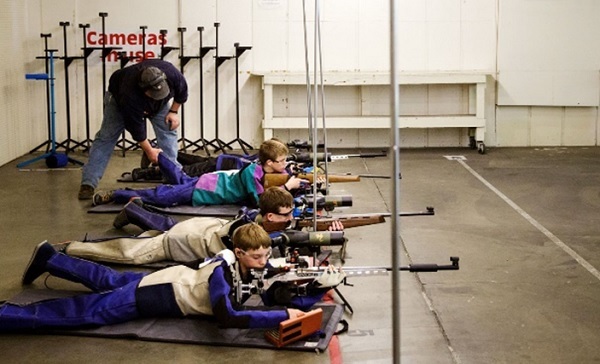 Children at the firing line at the Vancouver (Wash.) Rifle and Pistol Club, a CMP affiliate. Quite often, youth groups affiliated with high school JROTC programs are forced to use commercial firing ranges where .22 caliber rifles and larger guns are regularly fired. The nation has an estimated 6,000 commercial indoor and outdoor gun ranges, but only 201 have been inspected in the past decade, according to a Seattle Times analysis of Occupational Safety and Health Administration (OSHA) records. Although the CMP says it insures inspections of JROTC firing ranges, someone dropped the ball at the Vancouver (Wash.) Rifle and Pistol Club, a CMP affiliate. In 2010, blood tests revealed that 20 youths had been exposed to lead after shooting in the club’s dirty and poorly ventilated range. Lead on the floor was a thousand times higher than a federal housing guideline for allowable lead on surfaces. JROTC Teams and the Young Marines from schools in the district regularly shoot there. The Young Marines, it should be noted, is open to kids 3rd grade and above. These children love firearms. When schools across the country don’t use their own classrooms and gyms for shooting ranges, they go to places like this. Investigators found that ventilation failed to move the airborne lead particles downrange away from shooters. Children inhaled lead, ate lead and absorbed lead through skin contact with dirty surfaces. In 2013 a group of parents in Montgomery County, Maryland approached district officials regarding their concerns about the potential for lead exposure in regular classrooms used for both firing ranges and academic subjects. Montgomery school officials cited the HET/Rodosevich findings used by the CMP. 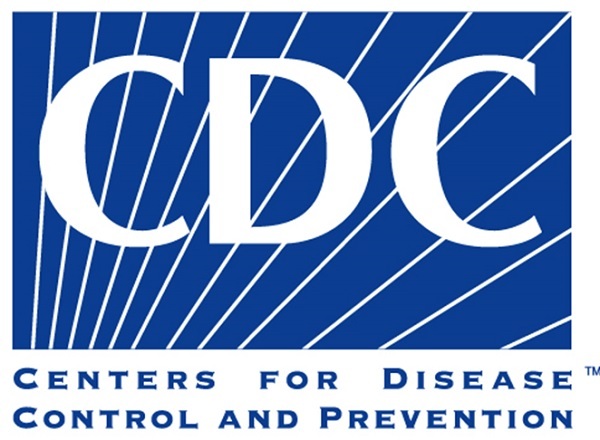 Montgomery said children who participate in air rifle shooting can effectively minimize their lead exposure by washing their hands after shooting and by not consuming food or beverages on the range. That was it. “Effectively minimize.” That doesn’t mean eliminate. The CDC says there’s no safe blood level of lead for children. Affluent Fairfax County, Virginia was confronted by another group of determined, organized parents with the same concerns. Unlike Montgomery, Fairfax immediately took action, once school officials became aware of the firing ranges! No one in the central office knew the ranges existed, but, to their credit, they immediately ordered lead testing. Lead dust covered the classrooms where tests were conducted. The county shut the ranges down and hired contractors to clean the lead out of the rooms. Letters were sent to parents of students whom school officials determined might have also been exposed to the dust. 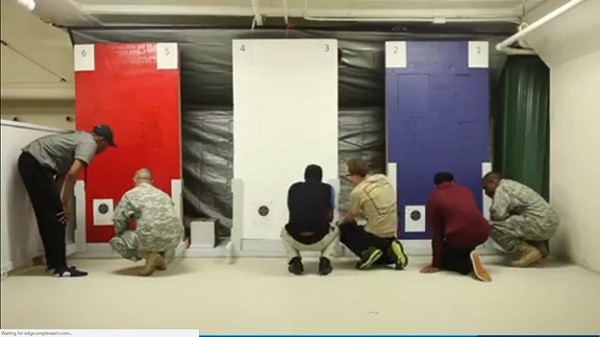 Wrestlers at Mount Vernon used the JROTC shooting room for wrestling practice. Fairfax immediately banned use of lead ammunition in the schools, but it’s OK in neighboring Montgomery. The CMP has developed stringent rules, but their enforcement is lacking and their suggested procedures are misguided. For instance, to clean up the deposits of lead at the firing line and target area, the CMP advises, “a periodic wet mopping with a solution of water and tri-sodium phosphate” (TSP) should do the trick.” However, the US Department of Housing and Urban Development bans tri-sodium phosphate when cleaning up the lead because it is deadly to the environment and no better than many other less harmful cleaning agents. High school students regularly cross the firing line. When the class period is over, floors may remain uncleaned, and the firing line disappears, and furniture is rearranged while the next group of students file in for an unrelated academic subject. Meanwhile, the lead dust is stirred into the air and picked up by students on their shoes, hair, clothing, and backpacks to be transported throughout the school. Kids become like dust mops, spreading the deadly material throughout the building. A 1-year-old boy in Connecticut was found to have high blood lead levels during a routine doctor’s visit. 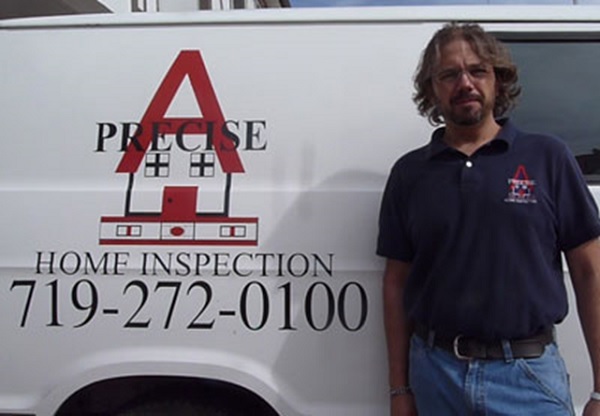 The exposure was traced to his father’s job as a maintenance worker at an indoor shooting range. Will it play in Peoria? Apparently so. The Richwoods High School Marine Corps JROTC Rifle team’s range has six firing lanes, but when they have air rifle matches for larger numbers, the team uses the local roller skating rink.